What is a makerspace? We’re glad you asked. Want to know more about how you can use a 3D printer in your classroom? Learn about the Dremel 3D45 3D printer here. When’s the last time you made something or took something apart to see how it worked or to turn it into something else? Unless you have a hobby that requires you to be hands on, you probably haven’t made anything in a while. For many of us, making something is both a difficult and rewarding process. While the motivation is there, finding the time and place to tinker can be a whole other barrier to entry—unless you have access to a makerspace. You might have heard of a makerspace. It’s a buzzword that’s been floating around for a few years now. But what, exactly, is it? A makerspace is a room that contains tools and components, allowing people to enter with an idea and leave with a complete project. The best part is that makerspaces are communal. The goal is to work together to learn, collaborate, and share. Most importantly, makerspaces allow us to explore, create new things, or improve things that already exist. Makerspaces are part of what we call the maker movement, which started in the early 2000s. Of course, scrapbooking, tinkering, and other arts and crafts activities have been around for quite some time, but the maker movement emphasized hands-on discovery in a world that had become increasingly automated. Is a makerspace something I should look to create for my students? In a word, absolutely. If makerspaces are ideal for anything it’s fostering play and open-ended learning. Kids naturally tinker; they build things and take things apart—especially when they’re left unattended! Makerspaces encourage that natural creativity. Your students will also be able to practice critical thinking skills, challenge their imaginations, and come up with solutions to real-world problems. Makerspaces are really helpful for STE(A)M-related activities. For instance, Brooke Brown of Teach Outside the Box Most features STEM bins in her makerspace, giving students hands-on opportunities to practice their STEM skills. 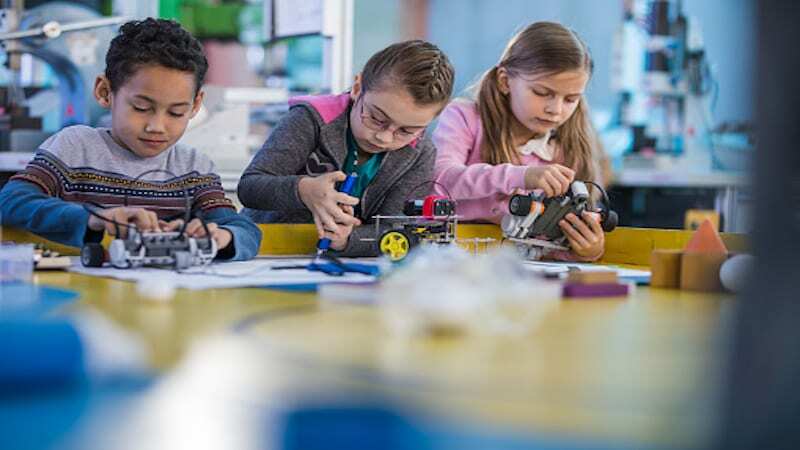 More importantly, makerspaces are safe places for students to “fail.” At a time when test scores and getting the right answer often trump the process of learning, makerspaces allow students to learn by trial and error, improving with each attempt. How do I set up a makerspace for my students? As the idea of makerspaces caught on, places like universities and local libraries began creating them. Though you might not have the resources of MIT or even your local library, you can definitely create a makerspace. You’ll need room for tools, a table(s), and space for students to move around and work together. Choose a section of your classroom to set up a makerspace or talk with administrators about a room in the school, like an old science lab, that might be available. Space in the library could be ideal. Diana Rendina, librarian at Stewart Middle School in Tampa, Florida, started a makerspace in the school library in 2014. Wherever you put your makerspace, be sure to think about which grade level(s) will be using the space, what topics or learning goals will be addressed, and how often the space will be used. Next step, get tools for your makerspace—but don’t break the bank. You’ll want things like batteries, popsicle sticks, old boxes, small machines, and rotary tools. Ask for donations from families and also from the school custodian. That way, you can use whatever funding you have for higher-end items, such as a tablet, a circuit set, or the crown jewel of any makerspace: the 3D printer. We’re really fond of Dremel 3D printers. They’re perfectly suited for the classroom. They’re easy to use, safe, and can also help your students’ ideas come to life. You can easily connect them to your school WiFi or ethernet, manage and configure multiple printers from one spot, and use the built-in camera to monitor them. You can also use Dremel 3D printers for standards-based learning projects and activities. They’ll fit nicely in your makerspace—and your curriculum. Sounds awesome, but not missing room in your budget? Well, you’re in luck. You can enter to win a Dremel 3D printer for your classroom here! If you win, your students might develop something incredibly useful, like the group of high schoolers in Riverdale Park, Maryland. They used a 3D printer to make a prosthetic arm for their classmate. How can I use a makerspace alongside my curriculum? Although STE(A)M activities easily lend themselves to the makerspace, there’s a makerspace-appropriate project or two for any subject. Use leftover jelly beans to introduce your students to architecture and engineering. That lesson you taught on westward expansion? Have students use the makerspace to build tool that would help them on The Oregon Trail and explain to the class how it works. Studying waterways in science? What might your students create to help stem flooding or address the problem of plastic trash polluting water? Nothing says medieval times—and physics!—like making a catapult! The possibilities are as vast as the imaginations of your students. All you need is to create a makerspace to witness just how far your students’ thinking and imaginations can go. Win a 3D Printer for Your Classroom! Dremel DigiLab is giving away a 3D printer (worth $1799!) you can use as the centerpiece of your classroom makerspace. Enter here for a chance to help your students bring their creations to life!